Sixto Sanchez topped Baseball America's annual Phillies Top Ten Prospects list. Several former BlueClaws highlighted the Baseball America annual Phillies Top Ten Prospects list, led by 2017 BlueClaws pitcher Sixto Sanchez. The list includes six former BlueClaws and several others that could be with the BlueClaws in 2019. To read more from Baseball America, click here. 1. RHP Sixto Sanchez (2017) - The right-hander tops the list after ranking 2nd behind JP Crawford last year. Sanchez made 13 starts with the BlueClaws in 2017, going 5-3 with a 2.41 ERA. This year, he went 4-3 with a 2.51 ERA over eigh tstarts with Clearwater. The Domincan Republic native won't turn 21 until July 29th. 2. 3B Alec Bohm - Bohm was the 3rd overall pick in the 2018 draft out of Wichita State. In his first professional season, he played 40 games between the Gulf Coast League and Williamsport in the NY-Penn League. The Omaha, Nebraska native hit .339 as a junior for the Shockers in 2018. 3. SS Luis Garcia - The 18 year old from San Pedro de Macoris in the Dominican Republic hit .369 in 43 games in the Gulf Coast League last year, adding 12 stolen bases. He led the league in batting average while finishing third with 32 RBIs and third with a .433 on-base percentage. 4. RHP Adonis Medina (2017) - Medina, a 22 year old from Santo Domingo, had a 3.01 ERA with the BlueClaws in 2017. He added 133 strikeouts in 119 innings pitched. He moved to Clearwater last year and went 10-4 with a 4.12 ERA and 123 strikeouts in 111 innings pitched. 5. OF Adam Haseley (2017) - The 7th overall pick in 2017 from the University of Virginia, Haseley made his BlueClaws debut in 2017, hitting .258 over 18 games. In 2018, he hit .300 in 79 games with Clearwater and .316 in 39 games with Reading, adding a combined 11 home runs. 6. LHP JoJo Romero (2017) - A 4th round pick in the 2016 draft from Yavapai Junior College, Romero spent the first-half of the 2017 season with the BlueClaws, going 5-1 with a 2.11 ERA. He was promoted to Clearwater after one second-half start and went 5-2 with a 2.24 ERA with the Threshers. He was 7-6 with a 3.80 ERA with Reading in 2018. 7. RHP Enyel de los Santos - Acquired from the Padres in December of 2017 for Freddy Galvis (a 2008 BlueClaw), de los Santos spent the bulk of the year in Lehigh Valley, going 10-5 with a 2.63 ERA before seven appearances in the big leagues at the end of the season. 8. RHP Spencer Howard (2018) - The right-hander from Cal-Poly was the Phillies 2nd round pick in 2017. 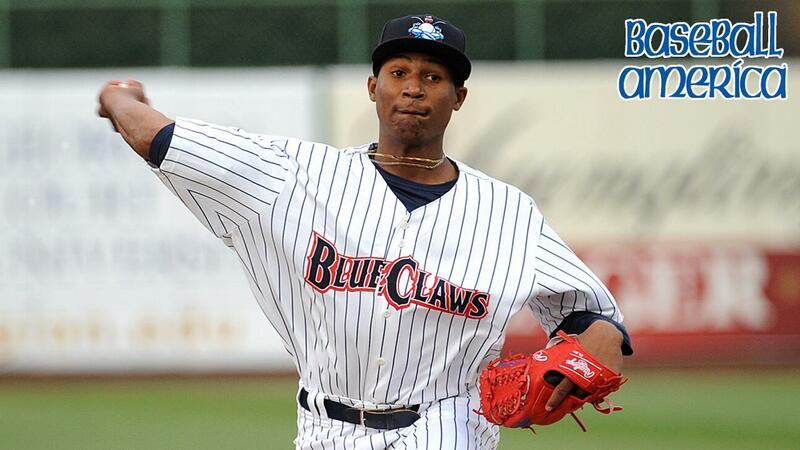 He had a 3.78 ERA and 147 strikeouts in 112 innings forthe BlueClaws this year. The highlight of his season was a no-hitter to win Game Two of the 2018 South Atlantic League Northern Division Championship Series. Read more about that performance here. 9. LHP Ranger Suarez (2017) - Suarez from Venezuela, made his BlueClaws debut in 2017 and pitched to a sparkling 1.59 ERA over 14 starts before a promotion to Clearwater. In his penultimate BlueClaws start, he took a perfect game into the 8th inning against Greensboro before allowing a hit to the 24th batter he faced. This year, he pitched for both Reading and Lehigh Valley before earning a call-up to the Phillies in September. 10. RHP Francisco Morales - Morales, from Venezuela, turned 19 in October after pitching for Williamsport last summer. He struck out 68 hitters in 56.1 innings with the Crosscutters last year. BlueClaws Membership Plans (more information here) are currently on sale. Membership Plans include premium items and tickets to some of the top games of the season. Plus, each Plan also includes a hot dog, soda, and ice cream at each game, plus a round of mini golf and a boardwalk game ticket at each game. To order, call a BlueClaws representative at 732-901-7000 option 3 or click here to order online. 2019 BlueClaws Group Outings are also available. Click here for more information.